Senator Susan Collins is the only GOP senator from New England. She has opposed some of the president’s nominees and actions. WASHINGTON — After breaking her ankle, Senator Susan Collins was forced to navigate the halls of Congress with a motorized wheelchair. One consequence: increased difficulty dodging reporters who line the halls, peppering members of Congress with questions. The result? 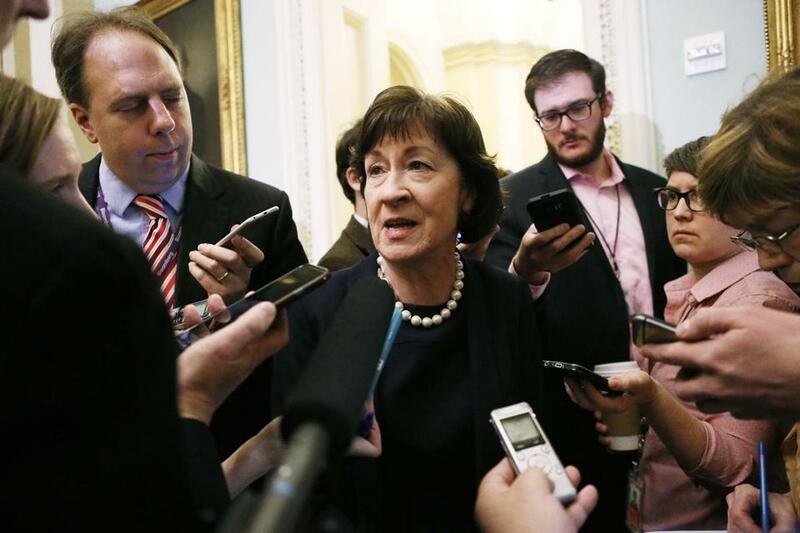 Collins has made headlines quite frequently since Donald Trump took office, emerging as part of a small group of Republicans who have shown they are unafraid to speak out against their party’s standard-bearer. At the same time, Collins finds herself part of a vanishing breed: a Republican from New England. When New Hampshire’s Kelly Ayotte lost her Senate reelection bid to Maggie Hassan, a Democrat, Collins became the only Republican senator from New England. Representative Bruce Poliquin of Maine is the only Republican from New England in the House. The decline of New England Republicans in Congress — which mirrors the decline of Southern Democrats — has become a trend for a region that once served as the anchor of the Republican Party’s moderate wing with senators such as Olympia Snowe of Maine and John Chafee of Rhode Island. Historically, New England Republicans have been known as moderate lawmakers who are fiscally conservative and socially moderate. Nelson said the new crop of Republican senators takes a much more confrontational approach to politics, which has resulted in more partisanship. “It’s unfortunate the Republican Party yoked itself to the South and as a consequence imbuing itself with all the unfortunate characteristics of Southern politics, one of which happens to be racism,” he said. Nelson added that Collins remains quite popular in Maine, and unlike other senators, she does not have to worry about upsetting Trump’s base and paying the price at the polls in 2020. “She is much more secure than some of the others who are fearful of being challenged in primaries,” he said. In just the first three weeks of Trump’s presidency, Collins has denounced his lack of coordination with other agencies on his immigration executive order, and she was one of only two Republicans to vote against Betsy DeVos to lead the Education Department. She also eviscerated the White House for failing to mention Jews in its statement on Holocaust Remembrance Day. On Friday, she was the only Republican to vote against Scott Pruitt to head the Environmental Protection Agency. In a hallway interview (when Collins had progressed from the motorized wheelchair to a walking boot and a cane) she said she wasn’t making any particular change in voicing opposition to Trump. Instead, she said she was casting a skeptical eye toward the White House, just as she always has. 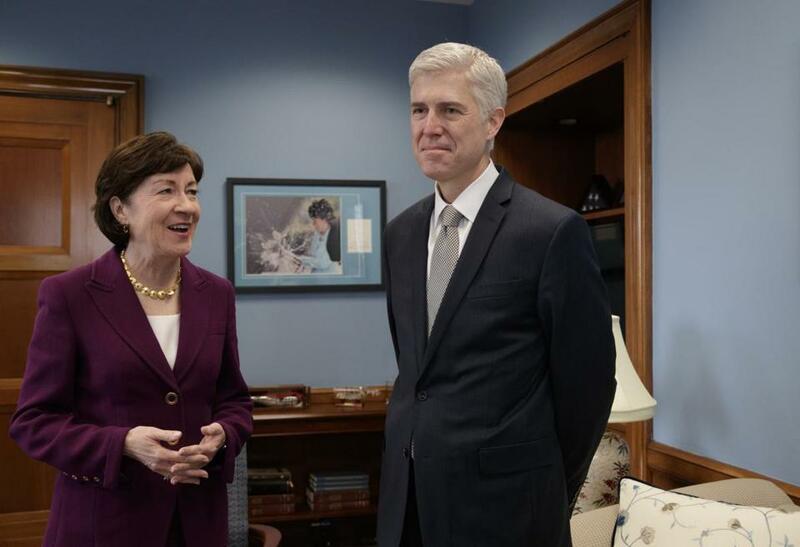 Collins met with Supreme Court nominee Neil Gorsuch on Feb. 9. During George W. Bush’s administration, for example, Collins criticized the president for using his executive authority to bypass laws enacted by Congress on topics ranging from civil liberties to the Federal Emergency Management Agency. As evidence, Collins referenced being named the most bipartisan lawmaker in a ranking by The Lugar Center and Georgetown University’s McCourt School of Public Policy for the last two sessions of Congress. “New Englanders, for the most part, expect that their representatives are going to be independent, speak their mind, and involved in the issues of the day,” she said. For Collins, that also means having a stellar attendance record; since she took office in 1997, she has cast more than 6,200 votes in a row, making her the Cal Ripken Jr. of the Senate. In the age of Trump, with major questions over separation of powers, Collins’s bipartisan approach is now attracting additional attention. In fact, she is one of the few Republicans who publicly stated she did not vote for the president. Collins announced her intention not to vote for Trump in an opinion piece for The Washington Post. On her ballot, she wrote in House Speaker Paul Ryan. “Donald Trump does not reflect historical Republican values nor the inclusive approach to governing that is critical to healing the divisions in our country,” she wrote. 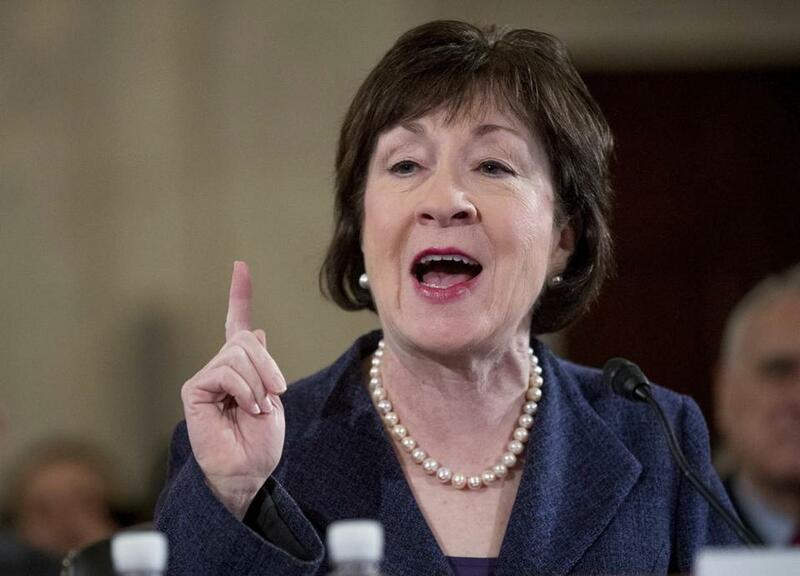 To those who know her, Collins’s emergence as a sometimes Trump critic is not surprising. Collins was elected to the Senate in 1996 after a failed gubernatorial campaign in Maine. She previously served as deputy state treasurer for Massachusetts and the director of the Small Business Administration’s regional office in Boston. Former senator Bill Cohen of Maine, who Collins worked for as an intern before joining his staff full time, said she always distinguished herself as someone with an independent mind. “Her approach has not changed over the years, but her influence has grown and will continue to grow as one of a small group of senators who weigh the merits of an individual issue above and beyond what the preferred position of her political party might be,” Cohen, who also served as secretary of defense, said in a statement. That approach hasn’t changed even as Collins navigates Trump’s unpredictable administration. But, as Collins continues to recover from her ankle injury, she is still adapting to some permanent change. “I’m a bionic woman with eight screws and a plate in one little ankle,” she said. Collins was one of only two Republicans to vote against Education Secretary Betsy DeVos’s nomination. She has also sided against the president on other issues, such as his travel ban. What does Presidents Day mean to Americans amid the Trump era?